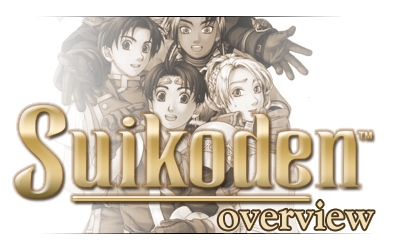 Welcome to RPG-O-Mania's Suikoden overview. 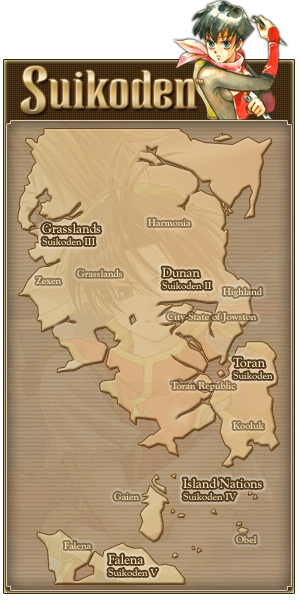 All Suikoden stories take place in the same world, there is a fixed timeline that even connects some of the games, events in Suikoden affect what happens in Suikoden 2, the story is really epic. Suikoden basically was a very free interpreation of Shuihu Zhuan, an old chinese legend about 108 Stars of Destiny. The sequels to Suikoden have nothing to do with the original legend anymore, but there are still the 108 Stars of Destiny. In the games, that means you can collect 108 party members (in some games even more, but they're not part of the 108 stars then), part of them can be taken into party, whereas other characters open shops or offer additional services.